Dr. Jacqueline Fulop-Goodling, D.M.D., P.C. 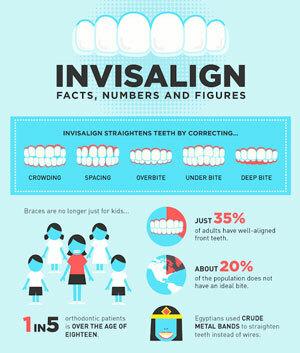 (aka Dr. Jacquie Smiles) recently released an infographic that discusses the facts, numbers, and figures of Invisalign. As a highly experienced Orthodontist in NYC, she is a member of The National Speaker’s Bureau and is an Invisalign Super Elite Provider, reserved for the top 1% of doctors in North America. Her goal is to help patients feel better about themselves by improving their health, occlusion, and dental esthetics. Approximately 20% of the population does not have an ideal bite. According to the infographic, Invisalign straightens teeth by correcting crowding, spacing, overbite, under bite, and a deep bite. Please check out some interesting statistics related to Invisalign and click on the thumbnail to view the full image. Dr. Jacquie was in the first group of 25 members of orthodontists ever certified with Invisalign’s prestigious Faculty group. Out of 55,000 doctors doing invisalign, there are only 25 faculty members. Since 2005, Dr. Jacquie was asked to be Invisalign’s National Spokesperson for a hygiene campaign and in 2009 became the Spokesperson for Invisalign Teen, launching it on the Tyra Bank’s show for the company.